What’s the Deal with Food in Dog Training? If you trained a dog 15 years ago, like when I was starting out, you probably didn’t use much food in that process. Sure, dogs might get a milkbone before bed, but we weren’t dicing up cheese and hot dogs in our kitchens before class. To be fair, my first obedience class did allow us to bring food treats for the dogs, but treats were used sparingly, and it’s possible that the food only added to the confusion that the dogs were most likely experiencing in those classes. I still get hesitation or resistance from some clients when I bring up the topic of using food rewards in training, because horror of horrors, the dog may learn to only do the behavior when the treat is present. As a culture, we have an expectation that our dogs should do what we ask of them, when we ask, without hesitation, and definitely without food involved. We’ve been taught that the key to happiness with our dogs is obedience, the dog will listen to what you say, no matter what. Is this a reasonable expectation of our dogs? If so, how do we achieve that high level of response to our cues? I will not expect 100% reliability from my dog until I can produce 100% reliability in myself, which is to say – never. Dogs are individuals, each of whom react to motivating factors differently. I expect that there are going to be situations where my dog may not do what I ask of her, and for the most part I know what those situations are for each of my dogs. When we set reasonable expectations for our dogs in any given situation, we are more likely to manage them appropriately, and less likely to be frustrated by their behavior. So, how do we get our dogs to do what we want them to do? Well, dogs (and all animals) learn things in two basic ways: 1) They work to earn something they want, OR 2) They work to avoid something they don’t want. Back when I started training dogs, dogs were taught to perform a behavior to avoid a correction. If the dog didn’t sit, they received a leash correction (a sharp jerk on the leash), often while wearing a training collar such as a choke chain or prong collar. One problem here is that we don’t always get to choose what our dog will do to avoid the unpleasant consequence, and many dogs will avoid the consequence by avoiding the work altogether. You can’t train your dog to do anything if he’s avoiding you. Other dogs will become desensitized to the unpleasant consequences, and will no longer work to avoid it, unless you increase the unpleasantness. After running into several of these issues with my own dogs, I decided to look for a different way. A new generation of dogs benefits my decision to change how I was training. 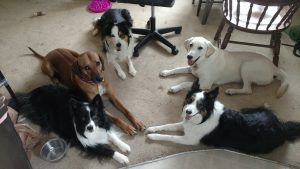 Tori, Fawkes, Pirate, Millie, and Mia have all learned that staying will result in things they want, like treats! Here’s where the food comes in. To be clear, there are many things other than food that dogs enjoy working to earn, such as access to freedom, and the best trainers utilize these other options skillfully. I’m going to talk specifically about food, because that seems to be a sticking point with many dog owners embarking on training. Food is a currency that works for all dogs, because they have to eat to live, so most dogs will work to earn a bit of food. What is puzzling to me is that many people seem to feel that using the food in training cheapens the relationship they have with their dog. Do you eat dinner with your family? Have you ever invited a friend out for lunch? What about bringing brownies to the new neighbor? Food is a big part of our human relationships, and so it should be with dogs. Teaching your dog to work to earn food will create longer lasting, and more reliable behaviors in the long run, plus you will develop an amazing relationship with your dog. Food can also be used to create positive associations with anything that scares our dogs, helping their brains to switch from fear to acceptance, or even excitement. How reliable can a dog become when trained with food? That may depend on a variety of factors including the dog’s personality, temperament, age, and physical status, as well as your commitment to training, opportunities for training, and training skills. In my experience, dogs who work to earn something, rather than working to avoid something, develop a higher level of reliability without relying on tools (such as a training collar) to maintain that reliability. As previously mentioned, food is just one of the many things dogs will work to earn, and including a variety of desirable consequences in your training will increase your dog’s reliability. In conclusion, we should embrace the use of food in our training and maintaining our relationships with our dogs! Many of the skills we expect our dogs to know do not come naturally to them, and we need to pay them for their hard work in learning these skills. If food isn’t working for you in training your dog, you need to step back and look at the technique, rather than blaming the food. Training is a skill that must be learned, whether through books, seminars, YouTube videos, or lessons with a professional trainer. If you are struggling with your dog’s behavior, and you’ve resisted using food in the past, or have tried and not gotten the results you wanted, contact a professional trainer for help in adapting your technique to meet your goals!